Armani Jumpers for Goalposts, Isn't it? London_Duncan Armani Jumpers for Goalposts, Isn't it? In the modern football world somehow it doesn’t seem particularly strange that London clubs two miles apart in SW6 should arrange for their reserve sides to play a local derby 40 miles down the M3 in Hampshire. Not content with that, nominal hosts Chelsea don’t even try to pretend they’re fielding a team of reserves in the traditional sense. Their website has stated for a few seasons now that an outing with their second string “is often seen as a step up from the youth team rather than a place for the first team squad players,” which makes the banner outside Aldershot’s Recreation Ground trumpeting “See Premiership players for only £5!” seem ever more incongruous. Fulham at least featured a sprinkling of first team squad members such as Moritz Volz and Ahmad Elrich amongst their starters, though they couldn’t help but enter into the spirit of things by inviting the predominantly Chelsea supporting, and very reasonable thousand or so strong, crowd to guess who these were as the shirt numbers bore no resemblance at all to those in the programme, a regular feature of games away from the national gaze. After the initial frisson provided by the opening fixture of the season the balmy evening seemed to get to everyone and the first half contained very little incident until the sun started to set. Then, on the stroke of half-time, Chelsea’s England Under 19 central defender Michael Mancienne glanced a corner wide shortly before Fulham ‘keeper Corrin Brooks-Meade got in a tangle with his defenders that resulted in a scrambled clearance and a renewed Chelsea attack saw prolific pre-season scorer Scott Sinclair, playing wide right on the night, roll his defender before feeding attacking midfielder Jonas Elmer who sidefooted narrowly wide. Elmer, who looks a bit like a young Karel Poborsky, had been at the heart of most of Chelsea’s best attacking in the opening forty-five minutes, always available, bringing colleagues into the game and looking a threat around the opposition box. Sadly for neutrals, the game was over as a contest before the hour mark. Fulham centre back Gabriel Zakuani, recently acquired from Leyton Orient where we also had been impressed with his play, had begun the evening in imposing fashion when midway through the first half he let the ball skid under his foot and had to work hard to race back and regain possession. Near half time his slip let in Jimmy Smith whom Zakuani then pulled back and was lucky there was a covering defender to keep the inevitable card at yellow. Five minutes into the second half a long ball over the top found him grappling with explosive 17 year old Israeli substitute Ben Sahar in a race for goal and when they tumbled over just outside the area the only surprise was a straight red for Zakuani rather than a second yellow. 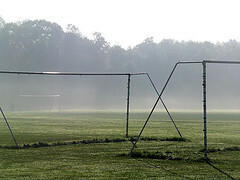 Picture of mist over the goalposts on the Common via wimbledonian's Flickr stream. The resulting free kick came to nothing, but Fulham never recovered. Four minutes later a left-to-right ball over the centre of the visitor’s remodelled rearguard found at least two defenders playing Smith onside despite strong protests. Chelsea’s captain on the night almost poked his first touch too far, but had just enough room to loop the opener over the advancing Brooks-Meade. Another four minutes passed and Chelsea doubled their lead as a ball over the top caught out Zakuani’s makeshift replacement and Sahar went one on one with the ‘keeper who blocked his shot well. A shot on the rebound seemed to have been cleared away to safety wide on the right, but the speedy Sinclair swooped to launch the loose ball first time inside the near post from 25 yards. Sinclair’s second arrived in cruel circumstances after Brooks-Meade’s brave block at Sahar’s feet following another misjudged ball over central defence unaccountably resulted in a penalty and, even more puzzlingly given the earlier decision, only a yellow card. Sinclair squeezed the penalty low off the ‘keeper’s left hand and in, then rounded off his night by cutting back the ball for another substitute, Phil Younghusband, to rifle home a fourth eight minutes from time. Chelsea were worth the win, but the result didn’t reflect the overall play on the night. It merely emphasised Fulham’s weakness at the back once Zakuani had gone, though his remaining partner Moncur strove mightily to make up for his absence. The loping Yinka Casal was a threat wide on the left and Lino Goncalves forced a smart save out of Yves Ma-Kalambay in the dying seconds. There will be 18 games which will be good in the development of the players and we will branch out into Europe and play the equivalent of league games against some of the European giants…It also gives the manager an opportunity if he wants to play a few of the first team squad in a really good game in a top class stadium. Why play Palace when you could play Real Madrid's B team at a palace? The Under 21 Champions League is nigh. You heard it here first.